We are located right in the city centre and next to the great views of the river and its Green Corridor. We are inside the historical neighbourhood and next to the great Basilica El Pilar and La Seo Cathedral. 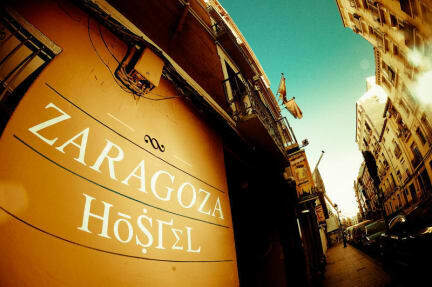 Zaragoza Hostel places you right on the spot to enjoy of the most authentic Spanish fiesta and take vibes of the mysterious city ready to be explored. Welcome travellers! If travelling is a dream, we don't want to wake up!!!! Great hostel with a cool vibe, well located walking distance from main attractions, train station easy reachable by bus and super underground cave with live concerts full of fun! i would suggest to a friend! Staff very friendly and helpfull. as my first hostle experience, i didnt know what to expect. however i had a great introduction to the hostle world with great and helpful staff at Albergue. would recommend! my only feedback would be on the matresses - they were not very comfortable. other than that, i would go back again! thank you! The hostel is very big, the 10bed dorm is quite spacious, however the 8bed dorm is not that enough with space, also many ants on the floor...but the jazz bar downstair is absolutly worth to visit!!! Everything pretty much okay! Two things to mention Anyway: wensite shouldn't allow hostels to settle their lower price without damn sheets... It doesn't matter if there is a tiny disclaimer somewhere, it is plain and unarguably scammy. And most important, Hostel Zaragoza should just fire the red mohawk guy from the night shift. He treated as if we were stupid and talked down on us every single time we had an interaction with him. Not bad. Didnt have much problems with the staff like the other reviews say. The wifi wasnt working, only at the reception. The sheets you had to pay for. Free and good lockers though. Not really a cool common area to meet people, but instead a bar with concerts downstairs. So, yeah pretty cool. The afternoon-shift guy could be more pleasant, I felt like I was bothering him when I checked in or asked a question, but the guy on night shifts was really friendly. Breakfast was cereals, white bread, butter, honey, milk, tea or coffee. No need for a padlock for the lockers, a key is provided. Good location in town, 40 minutes walking from bus/train station. Kitchen is basics but good. Sheets is 3€ not incl. The staff wasn't very friendly or at all helpful with anything I asked of them. The atmosphere is extremely loud and it was hard to get quality sleep. The free breakfast (starts at 0800) was a definite plus and really good. The location is excellent; situated in downtown by the main square (3-minute walk). Overall, I was unimpressed with the hostel overall. Hostel is extremely dirty, and has a terrible atmosphere. No hot water for showers, breakfast is just cereal and toast and staff are dismissive and come across as rude( especially the man at reception). WIFI only works down at reception, so if you need to use internet, you have to go down there. The place is more like a dirty school camp facility, would definitely not stay again. Do not recommend at all.